3000 B.C.- Natural wind chimes constructed of shells, stones, bones, wood, and bamboo believed to be from 3000 B.C. were unearthed during archeological digs in Southeast Asia. Because of this discovery, wind chimes are believed to be one of man’s first musical instruments. The wind chimes excavated in Bali, Indonesia are believed to have been used by farmers to scare birds away from crops. 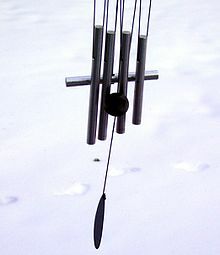 2000 B.C.- Metal wind chimes were created in Mediterranean countries, North Africa, and the Middle East. It is believed that these developed independently without influence from the wind chimes in Asia, which demonstrates the universality of these sweet instruments. 1100 B.C.- Wind chimes with bells were created in China. They were often hung in temples and places of worship, as they delicate pealing of the bells was believed to ward off evil spirits while calling in kind ones. Wind chimes have deep ties to Buddhist culture, and are believed to connect humans more deeply with the higher powers of the universe and act as calls to the gods during prayer. 1800 C.E.- The popularity of wind chimes spread from China to Japan, all across the Eastern world, and then to the West. This trend was called “Japonisme,” which refers to the notable permeation of Asian culture and artistic influence across Europe and the Western world. 1970 C.E.- Precision-tuned wind chimes were first manufactured. The shapes, materials, and artistic processes behind creating these chimes determines the exact sounds of the music they create. 2018 C.E.- Uno Alla Volta’s wind chimes are handmade in the thriving port city of Surat, India, with inspiration and influence drawn from a variety of artistic styles throughout history. The nana bells they often feature are highly characteristic of Indian designs. Feng-Shui: Wind chimes are believed to balance the energy within a home, as well as have a positive effect on the ambience of a space. Anti-Anxiety: As with all gentle noises, the soft sounds of wind chimes can have a calming effect on the listener, lessening their symptoms of stress and anxiety. -Wind chimes were often hung from trees by Celtic soldiers to scare enemy troops into believing the woods were haunted. -When hung outdoors, wind chimes can be used as a basic method of meteorology, as changes in their sound patterns indicate changes in wind speeds. Feeling inspired? Shop Uno Alla Volta’s collection of handmade windchimes here!